2. is obviously corrupt: eg. BC Rail scandal, H.S.T. average BCer with the tools to face this horrible recession. I just finished watching the Global TV speech, and all I saw was a person on his last legs grasping at straws by trying to convince those who are middle or upper class employed that they will be, will be, better off with the H.S.T in the future, that there will ...be tax cuts next year, and that the Strong Start program will fix our elementary school system. Don`t forget about most of your friends who are legitimately griping about the loss of customers in their shops and restaurants, or about how the H.S.T. erodes their buying power now, or about the fact that 11 or more schools are set to close in East Vancouver. Read over what you see above you, and then decide if this guy is a bullshitter or not. Thanks David Beatty for stirring me up again. P.S. By the way, if you haven`t already noticed, his address seemed to be aimed at the privileged, the shrinking middle class and anyone with short term mainstream media memory loss, who surely comprise a minority in B.C.. Let`s face it, 70 % of B.C.ers probably still earn o less than $20,000 a year now. Are we gonna have to buy this soup again ? hatsawrap is right. This is supposed to be a referendum, not a call for an election if Christy and the libs lose. As far as I’m concerned, though, it is really an assessment of her leadership skills to date, and Dix has her on that one, so it looks like the H.S.T. is doomed, due to her unethical manoeverings to get around a loss, like the wording, playing up Canada Post strike, and pledging $ to sundry middle class community groups while ignoring the poor on the D.T.E.S. : ie. 12 womens groups denied funding; though $200 million signed pledge by Coleman + feds for social housing, nothing has been done to date, no Pantages buyout for 100% social housing,not 20%; no C.C.A.P. agreement on partner or advisor within L.A.P. process, controlled by Harcourt and Wong’s B.C.S. and corporate city council,And the rest we all know: the $6 million legal fees for Basi+ Virk,memo on B.C. 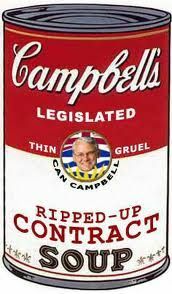 rail deal to Christy and relative; BC Ferries sell off, BCrail, privatization and dereg. ; she didn’t finish her degrees at S.F.U. not the Sorbonne. All the way gone ! Crunchy ???? You and the libs are finally on your way out, because you can’t lose the H.S.T. battle, and then go on to win our hearts in an election filled with more empty promises ,except for the $30 billion shipbuilding contract which we’re sure to receive hands down, given our geography and relationship with China, and that will mean less dependence on the debt failing U.S.A/Obama/ Republican congress. I can go on, but we all know her fate. The B.C. public aren’t that stupid. For me the real war began thousands of years ago,since Jews and Arabs were once brothers (literally). This is a family fight that has transformed throughout ...history,and has now transmogrified into the unreal scenario we feel now, being fought both in the virtual world as well as on the world stage. True science fiction: internet, drones, spies, nuclear weapons,etc. `global terrorist` threat warning. You`re damned if you do and damned if you don`t. No one would be able to hide if a North American jihad ever did become a reality, especially Jews no matter how they spin doctor themselves. Of course I accept the shock therapy premise,but because Naomi raised my consciousness, I now have the tools to understand better.I feel like I am tied to a very taut rope, with Netanyahoo pulling me one way, and the Palestinian people`s plight pulling the other, with Bin Laden at the helm. Everyday,especially because I live in Vancouver,a stronghold for Palestinian human rights and state recognition,I must deeply search my soul and my heart. Despite my genes. Unfortunately, in this Tower of Babel stage of global division,it appears that the State can define anyone as a threat for the silliest reason, simply out of a general paranoia that it created in the first place.However, only G-d knows what the outcome will be. Often I resent the fact that non-semites are involved in this struggle for Palestinian statehood, because in my heart, I believe, that their participation can obfuscate the facts, and perpetuate the blame game. I know you`re tryng to help though. For me, a sephardic Jew, as for Palestinians, being semitic (Arab or Jewish) by birth puts us both at an obvious advantage genetically,spiritually, and intellectually, from an intelligence (not I.Q. but re: security issues) standpoint, with regard to understanding our differences. However, pro Palestinian resistance forces in Vancouver,not knowing anything about me at all, will still automatically brand me as a Zionist, the enemy, and will not even recognize me as a possible ally as soon as I see them. It is hard to explain.There are probably many Jews here who support their struggle for statehood through participation in their conferences, concerts, and . In fact there`s a mosque a few blocks away, and I always make sure that I walk by it with respect. However, every time I watch the mainstream media portrayal and reports, horrible photos of Palestinian people killed by Israelis, IDF or whatever, I think: here we go again:the heartwrenching ethical struggle is back to haunt me. Helen Thomas and Libby Davies, both defining Gaza as an `illegal` occupation, are wrong because of the technical definiton of the term. There was nothing `ìllegal` about Israel becoming a nation, but of course the terrorism Menachem Begin employed to do it (blowing up the King David Hotel, killing British miltary officers) was. In fact, you might say we invented today`s terrorism first, not the Palestinians. My point is this: It is obviously time for the U.S.A. to pull out of Afghanistan, a.s.a.p.,especially, to negotiate with Hamas, and to then negotiate Palestinian statehood in Gaza. The alternative is jihad, more shock and awe, and living in a fake democracy, imperialist, still colonialist, dominated by N.W.O. lackeys. The joint U.S.A., Canadian terrorist list should exclude Hamas, because they are the key to solving this whole thing. would have no ammunition at all, no more relevance. Furthermore, the world would suddenly become much safer. ...You're not kidding. ? At first I thought the NDP stuff was a bad joke what with the Global News reference and all. And then, (correct me if I'm wrong) you commented on your own blog piece? Twice. ? The second totally off topic auto-retort is something... Context is important for most folks. Perhaps you could help us understand your intent with that babble? "Us" would be any readers who are not you and yourself "commenting" on your own thoughts. ? You do realize that this is part of a national media co-op? Ultimately your "g-d only knows" attitude really needs a bit of backing. and the D.T.E.S. for ultra-left wing social democrats like me. revisionism and Wikipedia. It killed my Dad, and many of my people. Mount Pleasant. Everyone, including Palestinians, has the `right to exist`. Especially including me. especially if it`s the State. and yet another as I walk around Mount Pleasant simply observing and only occasionally interacting. Who can I trust ? years,many, many years before some of you arrived locally, or on the national scene. and aggressive Israel was globally. containing a Victoria man, that were prevented from entering Gaza. believe that coruption, complicity and witholding evidence (B.C. Rail) are at the root of this anti H.S.T. will easily be elected I hope, but we have ideological differences for obvious reasons due to the B.D.S. Gotta have faith, faith, faith! If you put your faith in the NDP, religion, the class system, celebrity, nationalism, formal education, credentials/history, then best of luck to you.